The group needs to achieve consensus whenever a change that needs to be replicated happens. This is the case for regular transactions but is also required for group membership changes and some internal messaging that keeps the group consistent. Consensus requires a majority of group members to agree on a given decision. When a majority of group members is lost, the group is unable to progress and blocks because it cannot secure majority or quorum. Quorum may be lost when there are multiple involuntary failures, causing a majority of servers to be removed abruptly from the group. For example in a group of 5 servers, if 3 of them become silent at once, the majority is compromised and thus no quorum can be achieved. In fact, the remaining two are not able to tell if the other 3 servers have crashed or whether a network partition has isolated these 2 alone and therefore the group cannot be reconfigured automatically. On the other hand, if servers exit the group voluntarily, they instruct the group that it should reconfigure itself. In practice, this means that a server that is leaving tells others that it is going away. This means that other members can reconfigure the group properly, the consistency of the membership is maintained and the majority is recalculated. For example, in the above scenario of 5 servers where 3 leave at once, if the 3 leaving servers warn the group that they are leaving, one by one, then the membership is able to adjust itself from 5 to 2, and at the same time, securing quorum while that happens. Loss of quorum is by itself a side-effect of bad planning. Plan the group size for the number of expected failures (regardless whether they are consecutive, happen all at once or are sporadic). The following sections explain what to do if the system partitions in such a way that no quorum is automatically achieved by the servers in the group. A primary that has been excluded from a group after a majority loss followed by a reconfiguration can contain extra transactions that are not included in the new group. If this happens, the attempt to add back the excluded member from the group results in an error with the message This member has more executed transactions than those present in the group. The replication_group_members performance schema table presents the status of each server in the current view from the perspective of this server. The majority of the time the system does not run into partitioning, and therefore the table shows information that is consistent across all servers in the group. In other words, the status of each server on this table is agreed by all in the current view. However, if there is network partitioning, and quorum is lost, then the table shows the status UNREACHABLE for those servers that it cannot contact. This information is exported by the local failure detector built into Group Replication. To understand this type of network partition the following section describes a scenario where there are initially 5 servers working together correctly, and the changes that then happen to the group once only 2 servers are online. The scenario is depicted in the figure. However, moments later there is a catastrophic failure and servers s3, s4 and s5 stop unexpectedly. A few seconds after this, looking again at the replication_group_members table on s1 shows that it is still online, but several others members are not. In fact, as seen below they are marked as UNREACHABLE. Moreover, the system could not reconfigure itself to change the membership, because the majority has been lost. The table shows that s1 is now in a group that has no means of progressing without external intervention, because a majority of the servers are unreachable. In this particular case, the group membership list needs to be reset to allow the system to proceed, which is explained in this section. 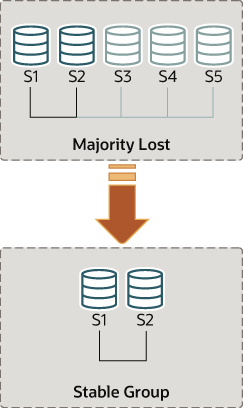 Alternatively, you could also choose to stop Group Replication on s1 and s2 (or stop completely s1 and s2), figure out what happened with s3, s4 and s5 and then restart Group Replication (or the servers). Group replication enables you to reset the group membership list by forcing a specific configuration. For instance in the case above, where s1 and s2 are the only servers online, you could chose to force a membership configuration consisting of only s1 and s2. This requires checking some information about s1 and s2 and then using the group_replication_force_members variable. Suppose that you are back in the situation where s1 and s2 are the only servers left in the group. Servers s3, s4 and s5 have left the group unexpectedly. To make servers s1 and s2 continue, you want to force a membership configuration that contains only s1 and s2. This procedure uses group_replication_force_members and should be considered a last resort remedy. It must be used with extreme care and only for overriding loss of quorum. If misused, it could create an artificial split-brain scenario or block the entire system altogether. The first thing to do is to check what is the peer address (group communication identifier) for s1 and s2. Log in to s1 and s2 and get that information as follows. This unblocks the group by forcing a different configuration. Check replication_group_members on both s1 and s2 to verify the group membership after this change. First on s1. When forcing a new membership configuration, make sure that any servers are going to be forced out of the group are indeed stopped. 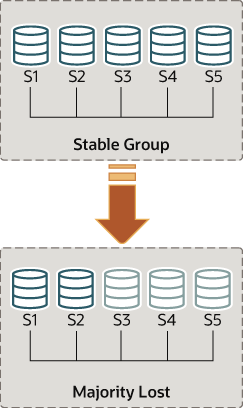 In the scenario depicted above, if s3, s4 and s5 are not really unreachable but instead are online, they may have formed their own functional partition (they are 3 out of 5, hence they have the majority). In that case, forcing a group membership list with s1 and s2 could create an artificial split-brain situation. Therefore it is important before forcing a new membership configuration to ensure that the servers to be excluded are indeed shutdown and if they are not, shut them down before proceeding. After you have used the group_replication_force_members system variable to successfully force a new group membership and unblock the group, ensure that you clear the system variable. group_replication_force_members must be empty in order to issue a START GROUP_REPLICATION statement.